Pros: Funny and razor sharp with perfectly measured performances. Cons: A couple of the smaller roles were played with an element of pantomime but this is nit-picking; Chekhov’s last play was certainly farcical as well as dramatic. It’s really saying something that yesterday when London was a giant sauna I took three trains, sat in a decidedly warm black box theatre, and still absolutely loved it! Written over a hundred years ago Chekhov’s wit in The Cherry Orchard has not dulled over time, and his plays about the dying Russian upper class still feel relevant to us class-obsessed Brits. But it isn’t just Chekhov’s classic text that shines in this show; the acting is superb. 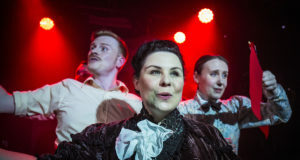 The cast is fairly large and has a good mix of ages, which in my experience is quite unusual for fringe shows and a theatre space of this size. The sheer amount of people on stage, along with offstage and background action, gave the illusion of a large and busy household. Without putting a foot out of line the ensemble cast give solid performances, and they truly bring to life this story of an aristocratic Russian family losing their estate. Graham Christopher is particularly well judged in his portrayal of Uncle Gaev, his sorrow and frustration really striking a chord. William Donaldson also impresses as Trofimov the frustrated revolutionary, who unlike those around him sees that Russia is changing, and its people must change too. 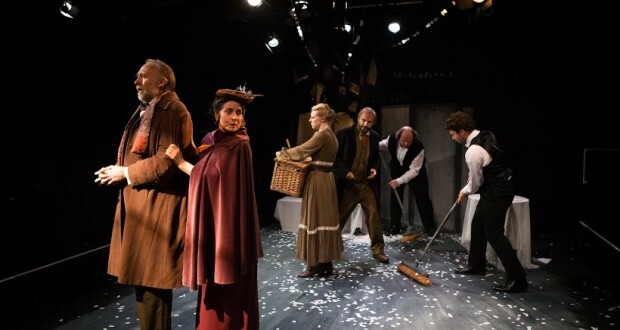 Chekhov’s dramatic portrait of the fundamental shift of Russian society is amazing, and the cast captures the spirit of the death of one way of life, as well as the birth of another. Most of the cast are also talented musicians and the use of music and singing in the piece adds real depth, making the silences count for more. This soundtrack also evokes a sense of impending doom and that time is running out as the family at the centre of the play slowly implodes; when the final climax occurs the music becomes funereal. Well composed and atmospheric, the music combines with the action across the duration of the drama to render the piece cinematic. 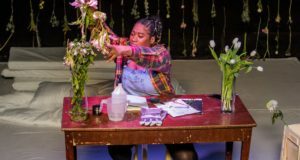 The look of the set is startlingly detailed with a few well-chosen pieces of furniture and a neat hanging décor that recalls the cherry trees that fill the orchard that is constantly under threat. 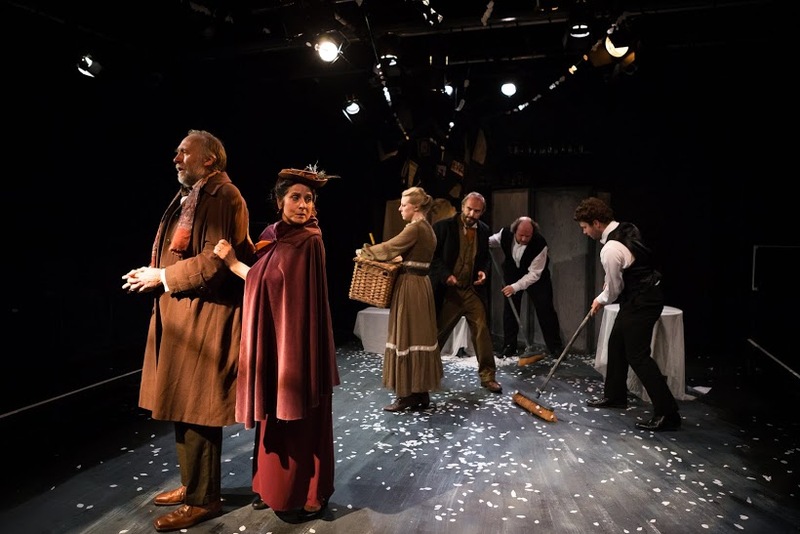 Along with the efforts of the cast the perfect costumes help to convince a room of boiling present day Londoners that not only are they in early 1900s Russia, but that it is -3 degrees and the depths of winter – perhaps the most impressive feat of all. Brockley Jack isn’t the most central or well connected of venues but this production is well worth the extra effort, even in this heat. If you watch Downton Abbey (go with me on this one), you’ll be familiar with the struggles of Lady Mary to get her family to face reality so they can hold onto their estate. This is the basic plot of The Cherry Orchard and even more than a century after it was written, and ninety years after the era of Downton Abbey, it still feels relevant and fresh. In short, this production is the strongest fringe theatre show I have seen in a long, long time.